Being that today is “National Doughnut Day,” seems fitting to share one of my Krispy Kreme Kreations with you. 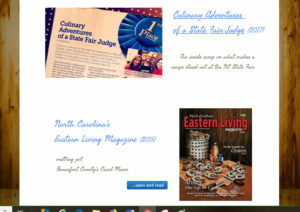 It just so happens that my lastest, krunchy Cinnamon-Butter Krispy Kreme Kroutons, is one of four North Carolina food icons I got to blab about in the November issue of Carolina Country Magazine. I chose Krispy Kreme as one of the four for a couple of reasons. 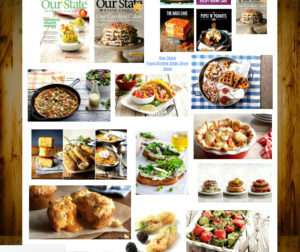 For starters, when talking about iconic foods here in North Carolina, KK is at or near the top of any such list. KK is also celebrating a milestone birthday this year… their 80th! I even made this scrumptious sundae with KK Kroutons and Kookies to celebrate. Aren’t we so happy Krispy Kreme was born? I’ve been making these blissful little krouton morsels for years, just never got around to sharing until now! You can make ’em in no time flat, but be warned. Nobody can eat just one, or 10, so make a big old mess of them! 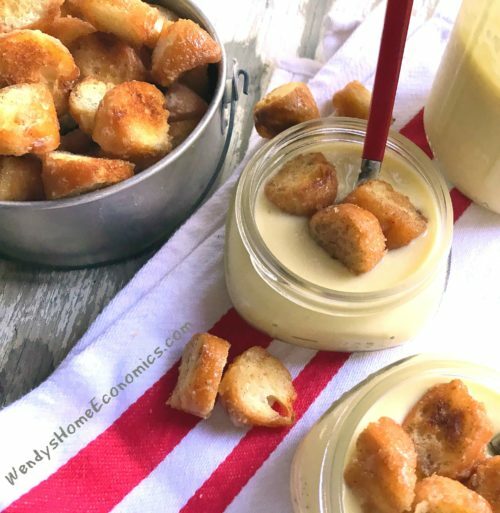 Folks love to munch on “kroutons” right out of the bowl, but I enjoy on top of Ma Perry’s Boiled Custard, a Perry family tradition that started before I came along… a long time ago. I do hope you will make some kroutons, and come back to let me know what you think… I’m pretty sure you will be the Kueen if you serve up a pile of these sometime soon. Don’t you think KK should bag my kroutons too? Krispy Kreme “Kroutons” are a fun treat by themselves, but floating in boiled custard to enjoy at the bottom of your cup is good, too! Using kitchen scissors, cut each doughnut into 12 "coins." Spread cut pieces out on baking pan and let air dry, uncovered, overnight. Preheat toaster oven or oven to 350 degrees. Melt butter in microwave and stir in cinnamon. Toss “kroutons” in bowl with cinnamon butter. Bake about 5 minutes, tossing as needed, until golden brown. Variation... Instead of cinnamon, use other spices or blends, like Apple Pie or Pumpkin Spice. So, what are your ideas for using Krispy Kreme Kroutons? One of North Carolina’s finest, Krispy Kreme Doughnuts, is turning 80 today! And THAT, my friends is cause for celebration. Those of us lucky enough to have grown up with being fed KK’s in our high chairs are truly blessed. And I’m certain, just better folk because of it. Life gets better with Krispy Kreme KKroutons & KKrispy KKookies! 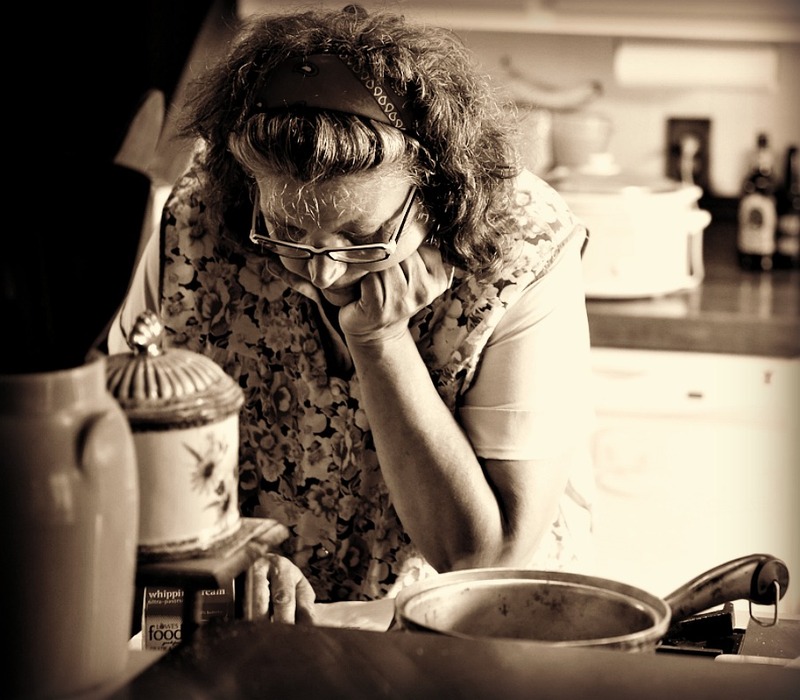 So many memories of going to the KK on Person Street in Raleigh and swooning by the doughnut-making room window…. and years later, beckoning the call of the “Hot Doughnuts Now” sign aglow! Even today, if passing by, I succumb to that sign!! My car just automatically “hangs a left” into the parking lot. And even though now there’s a drive-thru, I just must go inside…. for the full and complete experience ~ ok, so I just want to watch those morsels of heavenly round fried dough get slowly bathed in a shower of liquid sugar!! Oh lort, is there anything better on earth? If so, I’d just as soon not even know. My now ‘tween nephew Wyatt was raised “right” as they say… and in the south, that raise’n includes full indoctrination to Krispy Kremes from near’bout the time of birth. I suspect there are probably folks who detoured down Person St. over the years on their way home with their new baby… to celebrate! 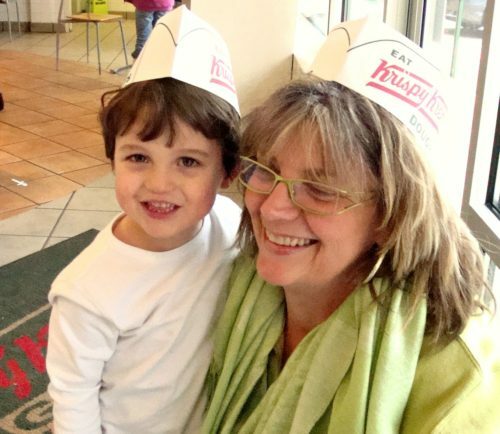 Surely made some fond memories with my nephew Wyatt on Person Street… @ Krispy Kreme! I’ve got other Krispy Kreme Koncoctions to share, so stay tuned. But for now, without further ado, I bring to you…. 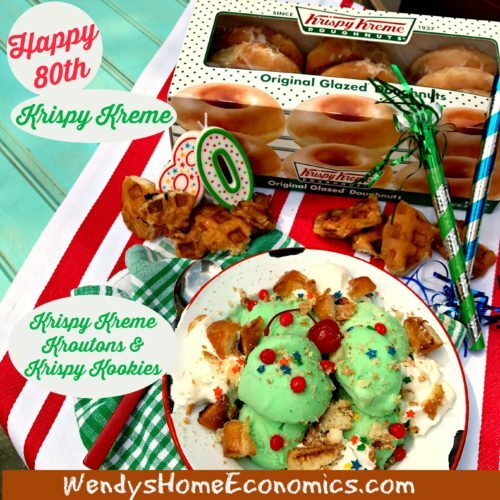 my Krispy Kreme Birthday Sundae “Kake” ~ because who needs “cake” when you can have Krispy Kreme Kroutons, Krispy Kreme Krispy Kookies and Krumbles instead! I’ve been making these things long as I can remember… (mostly just to nibble on) and decided as a birthday present to you, it was high time I passed along this quick little secret! 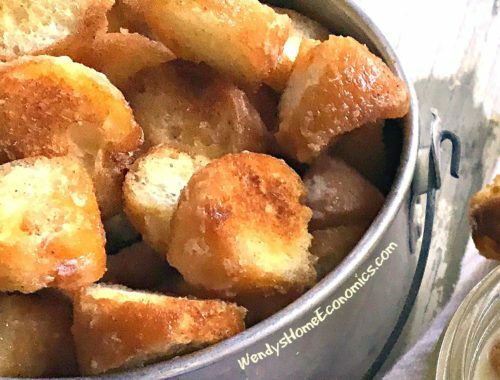 To make KK Kroutons, snip a few doughnuts with scissors and toast about 1-2 minutes in toaster oven until lightly browned. Let sit for about 5 minutes to let cool and turn krispy! EAT ’em. Or, scatter on ice cream sundaes…. or crumble and scatter on ice cream, on milk shakes…. they’re pretty tasty with a sprinkling of good flaky salt too. I find them rather tasty with crispy crunchy bacon with coffee in the morn. Put in the comments below what you’d do with them!?! To make KK Krispy Kookies, just tear doughnuts into about 4 pieces. Roll flat and place pieces into preheated waffle iron. It’s hard to say exactly how long since those things all seem to have a mind of their own… just check after a minute and keep a close eye on ’em or they will burn. 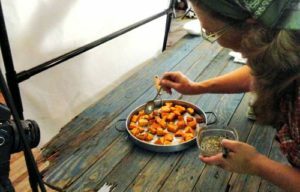 Lay out on a plate or pan and let cool. They will crisp up once well cooled! Great alongside ice cream… (you can use them to “dip” in your ice cream). Also yummy with a dab of peanut butter or with your morning yogurt. Let your mind go wild…. or, just eat them as they are! And a final note… Thank you, Mr. Vernon Rudolph, for bringing us this melt-in-your-mouth simply divine concoction. And thank you for an outstanding fundraising opportunity, that has bought band uniforms and air conditioners for schools, books for libraries… and paid for church needs too! Gosh, it surely would be interesting to see a list of all the many things your doughnuts have helped to fund. Now go make yourself one of these KKrispy treats…. because we all need to celebrate Krispy Kreme, right?